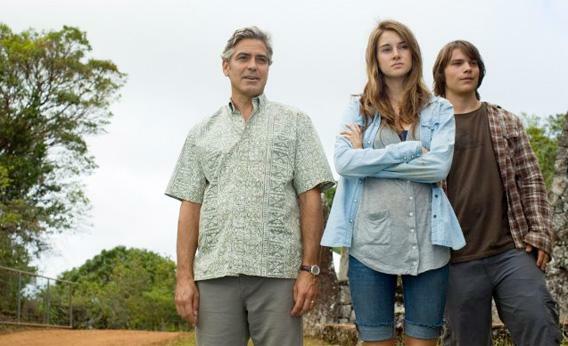 The Descendants: Alexander Payne’s movie is as profound as Terrence Malick’s Tree of Life. The sneaky profundity of The Descendants. Nominated for five Academy Awards, boasting an 89 percent rating from Rotten Tomatoes, and tallying a healthy $75 million (and counting) at the box office, The Descendants is hardly in need of a defense—but it is in need of further discussion. For all its success, Alexander Payne’s film has been less unappreciated than unexamined. Skeptics have dismissed it as mezzobrow indiewood, undeserving of scrutiny; yet even supporters have undersold its virtues, fixating on its (considerable) surface pleasures without noticing that Payne has made a layered and searching piece of work. Don’t let the soothing uke and sun-dappled sadness fool you—The Descendants is no less interested in the cosmic than that exegete’s delight The Tree of Life. Perhaps Payne’s insistence on making human-scaled drama obscures his reach. Allergic to grandiosity, his movies depict losers, schlubs, and schmos dealing with domestic turmoil and personal crises in a nondescript, lived-in America. Across those movies, Payne has carved out an authorial identity defined by career-making performances (Reese Witherspoon in Election, Paul Giamatti in Sideways), adroit tone shifts, and the pitch-perfect rendering of life in these United States. The Descendants shares many of those qualities, which might explain why the critical conversation surrounding the movie has seemed stunted, with most reviews amounting to little more than pronouncements of what “worked” and what didn’t. What such assessments overlook is a major American director working on his largest canvas yet and confronting some pretty fundamental questions. If Payne’s previous movies cast a sidelong glance at How We Live Now, this one emerges as an affecting inquiry into How We Live, period. Based on the novel by Kaui Hart Hemmings, The Descendants tells the story of Matt King (George Clooney), a real-estate lawyer whose wife, Elizabeth (Patricia Hastie), plunges into a permanent coma after a boating accident. But the grieving is interrupted when his teenage daughter, Alex (Shailene Woodley), reveals that Elizabeth had been having an affair. Meanwhile, another crisis looms as Matt, trustee of a large parcel of beachfront property on Kauai, presides over the dissolution of the trust—and finds himself having second thoughts about selling paradise despite the windfall awaiting him and his cousins. The title alludes to both plotlines. The Descendants spends most of its time with Matt and his descendants, Alex and Scottie (Amara Miller), the inattentive father explicitly wondering how to raise two daughters he has barely parented. But the movie also reminds us of Matt the descendant, privileged recipient of a lavish patrimony. At a couple of points, Payne interrupts the action to ruminate on ghostly photographs of Matt’s ancestors, staring back from the past as he ponders their bequest’s future. These haunting interludes give resonance to Matt’s earthly thrashings, anchoring his experience in something bigger than himself. The setting only enlarges the film’s scope. Much has been made of The Descendants’ focus on quotidian Hawaii, but such praise always seemed overblown. As J. Hoberman notes, “Despite a gesture or two toward Honolulu’s downside, Hawaii still feels like heaven on earth.” He meant that as a putdown, but it misses what Payne’s up to. The Descendants’ Hawaii is Edenic all right—intentionally so. Montages of the lush landscape not only offer rhythmic punctuation to the narrative, but gather cumulative power as emblems of eternity itself. Reminiscent of Ozu, these pillow shots—of sea against sky, mountains over beaches—encase the movie’s human drama in an elemental frame. The cutting between Matt’s grief and the indifferent beauty and humbling grandeur of the natural world suggests a transcendental perspective—as does Matt’s about-face on selling the land to developers. The Malickian outlook reaches its apotheosis in a climactic montage that transports us from a deathbed to clouds, cliffs, and shoreline, telescoping us from the earthbound to the timeless. It’s a diaphanous flourish all the more powerful for capping a resolutely naturalistic movie. The title is something of a giveaway. Dripping with biblical freight, it all but asks us to think of the story as metaphor. Finely observed family portraiture becomes something else: By the time Matt finally confronts his dilemma, it’s clear that the inheritance he’s brooding over isn’t just his—it’s ours as well. Payne suggests that we too came into an astounding bequest—our time in this world—and yet, as Matt admits of his birthright, we haven’t quite earned it. The Descendants implicitly asks: How do we justify this gift? What can supply meaning to an existence that’s but a blip in time? It’s in that context that Matt makes his choices. To his wife’s lover, he grants permission to make one last visit to Elizabeth; to his resentful father-in-law, he hides news of Elizabeth’s infidelity; to the land itself, he chooses preservation over profit. There’s something to Bilge Ebiri’s dismissal that The Descendants is the latest in a genre he calls “George Clooney Does the Right Thing.” Peer beyond the feel-good veneer, however, and you see a director interrogating, with something approaching grace, why we end up doing the right thing. Perhaps the movie’s most celebrated scene, the coda of Matt and the girls vegging on the couch and watching TV, offers something of a summa. On one level, the long-take scene is simplicity itself: A family restored, harmony achieved. But Payne packs the frame with suggestion. We see Scottie, curled up under a yellow quilt, the same one we saw over her mother when she breathed her last breath. It’s a lovely touch—the dead remembered and death reclaimed for the living. On the TV, we hear a familiar voice: Morgan Freeman narrating March of the Penguins. “It wasn’t always like this,” he intones, “Antarctica used to be a tropical paradise.” The snippet isn’t a throwaway gesture or a random choice, but a shrewd stroke. Juxtaposing real time with geological timelessness, Payne underscores his theme, even as gives his characters and the audience a gentle sendoff. Except for the fleet stylishness of Election—a movie made under the spell of Casino—Payne has never been a showy filmmaker. The director himself admits that he makes movies “within the commercial American narrative cinema”— movies that are legible to a mass audience. That may be why The Descendants hasn’t been subjected to the critical unpacking it merits. Indeed, in its obsession with the past, with ancestors, with transience, eternity, and our raison d’être, The Descendants emerges as an unlikely diptych partner to The Tree of Life. Both are fixated on grief and the human response: If The Tree of Life is about the invention of god, The Descendants is about the invention of morality. But while Malick’s movie inspired reams of engaged criticism, Payne’s has been a victim of critical complacency, damned (at best) as merely a good movie with good performances by a good director. It’s more than that. The Descendants is a sneakily profound film made by an artist in peak form. Pillow shots and inserts glimmer with meaning; the loveliest dissolves in recent cinema unlock reserves of emotion. The marketing tells us The Descendants is a vehicle for Clooney’s lifetime performance. Look closer, though, and it’s Payne’s breakthrough that you’ll see.